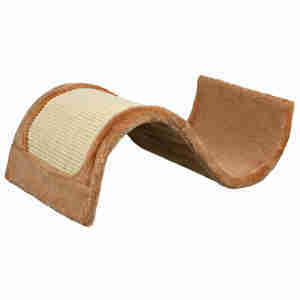 The Wavy Cat Scratching Board from Trixie provides a place for your cat to scratch, hide and rest all in one place. The sturdy wave has a sisal section for your cat to sharpen their claws and the rest of the board is covered in plush fabric – perfect for a post scratch nap! For cats that like to hide, the bottom of the wave provides a tube for them to crawl through. Dimensions: 50 (l) x 29 (w) x 18 (h) cm.